My mother-in-law always had a real serious “thing” for purses. Never saw anything like it. 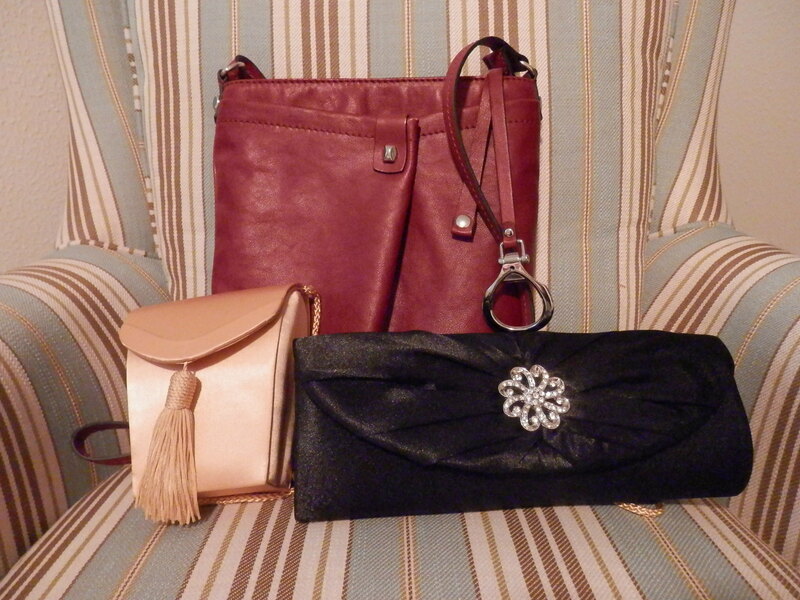 To call her the Imelda Marcos of purses would only be a slight exaggeration. Wilna’s multitude of value-priced, yet always chic handbags came in an assortment of sizes, shapes, and hues. I’d often marvel at the cute little clutches in assorted colors stacked in her closet that perfectly matched her footwear. You name the occasion … it had the perfect purse to go with it. A most refined lady if ever there was one. I’ll never forget one particular handbag she lugged around when hubby and I were first hitched back during the Jurassic Period. Actually, it looked rather like a small picnic basket than a purse. It had the distinctive woven wooden lattice work with checkerboard red and white fabric-covered lid that flipped up. Along the sides all around the whole purse were painted these tall, pencil thin buildings. Wilna’s oldest sister, an accomplished artist, painted the buildings to look like a scene from the French Quarter in New Orleans. Cutest thing you ever saw. For years, that purse seemed permanently attached with super glue to her right arm. Heck, a lady with a multitude of grandbabies (they called her “Granny”) had to be prepared for anything … drool, drips, scrapes, scratches and all manner of major and minor mishaps. Trust me … Granny’s purse could sub as a minor emergency clinic, or the Quicky Mart around the corner, depending on the occasion. Actually, the best thing about Granny’s purses had nothing to do with a particular style of handbag. It was more about how Granny would get one of her grandchildren under her spell with the possibilities of what was in the purse. I remember watching our daughter Katie when she was about three years young sitting close beside her Granny waiting patiently for a promised surprise. Granny scrunched over closer to Katie, and then ever so slowly, plucked out a stick of gum from the handbag and placed it ever so gently into the little girl’s hand as if it were solid gold. In that moment, something special passed between the two that had nothin’ to do with a plain old stick of gum. But Granny had a way about her that made a simple gesture, one of those special “I love you” moments. Some months after Granny turned eighty, ten years ago this November, she left this mortal plane. But not before saying many tender and tearful goodbyes to her cherished husband, children, grand and great-grandchildren, and a multitude of family and friends who loved and treasured the great lady. Her affection for purses is probably the reason why one of her nine daughters suggested Granny should be buried with one of her favorites, a smart-looking black clutch. It wasn’t long before family members started thinking about what they wanted to place inside Granny’s purse. Several of the younger grandchildren wrote loving goodbye letters to their Granny. Holy cards with “I love you” carefully printed on the back, school photographs, snapshots, and even a locket were also included. Tim, married to Granny’s daughter Michele for over thirty years back then, placed a medal of the Sacred Heart of Jesus, which he had carried in his wallet since the eighth grade. Mimi, our special needs daughter, placed the “Most Cheerful Camper Medal” she received one summer while attending camp. Cameron, one of several middle school-aged grandsons, tucked a little plastic football inside the purse. Yesterday in the mail we received a family photograph taken at a nephew’s wedding. My husband opened the large envelope. “What a great-looking bunch of family your parents helped to create. Your mother would have been so proud,” I said.